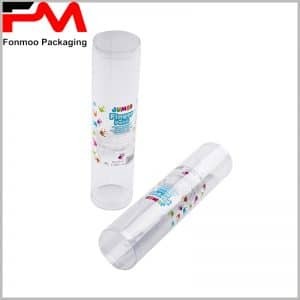 If you are looking for suitable packaging for your toy, electronic products, this plastic tube packaging box for gift with red butterfly ribbon can be a good choice. As we all know, plastic is a common choice of material of packaging for its numerous advantages, this box, made with PVC, also inherits those characteristics of plastics in terms of protection, exhibition and promotion. 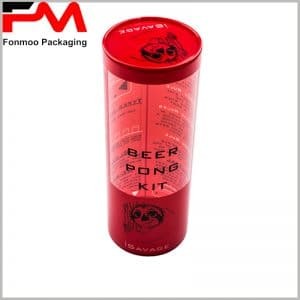 The overall body is clear, letting customers see directly the product inside and get attracted, while the lid and the bottom are printed with CMYK printing as not to be monotonous. The red butterfly ribbon, as a detachable decoration, makes it more adaptable for gift packaging. If you are interested with this model and want to make your own customized packaging based on it, do not hesitate to contact us and communicate what you need. Professional fabricator of tube boxes as we are, we will provide, with good condition and short delay, your own plastic tube packaging box with printed lid and bottom for toys or gifts.